Fill a double-glazing unit with water and keep small fish, water-fleas, etc. in it. It would need a plug at the top and the bottom. Take out the top plug for regular adding of nutrients and the bottom and top plugs together for periodic flushing and refilling. I think it would look cool. There'll be a circular, revolving room at the top of my castle, with fish-filled double-glazing. The fish will swim against the current and so will remain stationary while the room revolves... (Inspired by the circular room at the Monterey Bay Aquarium). i did this once, but didnt get far. i had a huge 3ft x 8ft piece of double paned window, reinforced with an aluminum frame around the edges, all sealed with something black and gummy and obviously watertight. i used it as a table for a couple years. then one day, turned it upright, drilled your "top hole" and started pouring water in. it only got 2/3 full before the water pressure burst outward shattering one pane. so disappointing! my plan was to put in a few seahorses- all of them left-facing, except one. unable to turn around, i wondered if they'd swim forward until they were forced to hang out at the left end, or get bored and swim a vertical loop in order to turn around. i plan to do this again someday, next time with smaller panels of paned glass in a grid in order to distribute the water pressure. 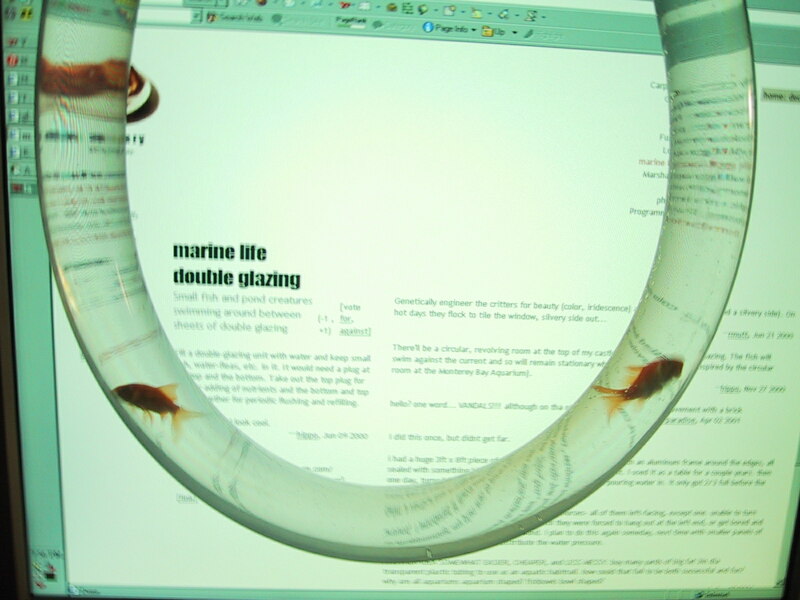 ANOTHER IDEA SOMEWHAT EASIER, CHEAPER, and LESS MESSY: buy many yards of big fat 3in dia transparent plastic tubing to use as an aquatic habitrail. how could that fail to be both successful and fun? why are all aquariums aquarium shaped? fishbowls bowl shaped? i have just returned from chinatown with 3ft of 1in dia transparent plastic hose ($3) and about a dozen gold feederfish ($1). i am presently rinsing the hose (simultaneously furthering the research on my linked idea) after which i will heat seal one end, dump the fish in, and pressure clamp the other end. wish me luck. voila! like them? i baked them myself. see link. gnormal, sure hope you got the water treatment drops too. yea- they did look a little uncomfortable after 20 min. so now i hang it vertically with the open end up. i have a 3ft deep fishpond hanging from my bookshelf! 18hrs later they are still having fun. as for the water treatment drops, "nevermind"! i asked the chinatown goldfish store tender (they sell only goldfish, usually to stock the aquariums in chinese restaurant windows) if i need to let some spring water set out overnight. the answer is yes, except in the case of feeder fish. "They don't care." he said. bad news (for those who might be surprised) one of the two occupants of the 1" x 1" x 36" vertical aquarium went motionless to the bottom sometime between +24 and +26 hrs. aquariums of any dimention have a way of regulating their population. so i was not disencouraged by this. "one, must be the magic number for a 1" x 1" x 36"-er", i thought. but sometime between +28 and +29 hrs, the final occupant went down. houston is working furiously at the moment, running the numbers. but the numbers are small (2, 1, and zero) so we do not feel as though we'd be jumping the gun in saying that... future missions will have entirely rethought dimensions. or perhaps this is not possible under existing technology. The ratio is 1 Gallon for every inch of fish, tail included. 'Feeder' goldfish can and will grow quite large-to 'Carp' size in many cases... They are 'feeder' fish due to their less desirable markings and plain shape. It is actually quite important to properly choose/prepare all components of the habitat. In your case-you are using hose which I assume is petroleum based - that leeches itself. It is also necessary to treat water with a small variety of off the shelf chemical items at a bonafide aquatic pet shop. This gives the fish water which contains no ammonia, etc. and is ph balanced, so on and so forth. As UnaBubba indicated-oxygen... I've had several sustainable aquariums--that is, aquariums which needed scant attention by me due to the enormous care and preparation I took to make a habitat which fish, amphibians, plants would thrive in. It takes quite some time to make a nearly fully self-sustaining environment, years in fact. I now have 2 octagonal aquariums, 1 is 5 gallons- the other 35. The 5 gallon tank absolutely requires far more care. The 35 requires hardly any- I could put a timer switch on the light bulb and it would require absolutely none-not even feeding. Cute pic of the condemned fish, try scanning at 1/2 the bit depth and decreasing color depth. That'll save your disk space as well as reduce finished jpg from 440KB. the pictures are straight out of the camera. the color depth is admittedly not as deep as my aquarium, but they are flashlit. i have two 1" feeders in a 2gal fishbowl right now. i orginally got $2 worth from the fishman (i didnt know it would be so many), and they died about 1/day until there were two left. i know this doesnt suprise you thumb- i just thought you appreciate that your numbers correspond exactly with my aquatic reality. but maybe this is suprising: these two fish have been enjoying life since 9/00 in a glass bowl with nothing in there but a couple rocks! i am amazed that they persist on (smooth clean) rock and (tap) water. i feed them every other day with lil pellets. but it seems they dont even need much of that either. i went overseas for the holidays and had no fishsitter. so (rather than give them extra food) i put them near the window and turned the heat down. two weeks later when i returned they were fine, chilling out near the bottom, barely moving. i love feeders! so efficient and flexible. easier to tend than a plant. i wonder if it's true about the 4 second memory. Blimey! I come back here (just after this idea's 1st Birthday) and find someone's been working hard implementing it. Congratulations to [gnormal] - truly inspirational work. 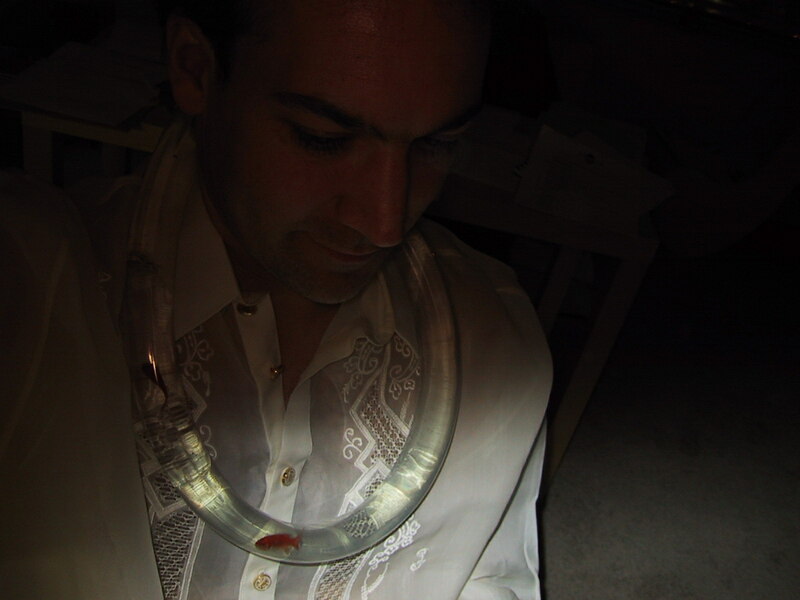 Do you have pet fish who follow you (via your tubing network) around your house now? anyone read any Iain Banks, in 'Walking on glass' he describes a castle with glass ceilings and floors, the void is filled with warm water (for heating), and Luminous tropical fish (for lighting). does anyone have any Luminous tropical fish? I suspect that the tubing idea suffers mainly from lack of water quantity, and lack of surface area. A reasonably large quantity of water is desirable for the purpose of dilluting fish waste. A reasonably large surface area is needed for oxygen/carbon dioxide transfer. You might be able to simulate large surface area by bubbling water through a sloping tube (a spiral pattern might be better than a diagonal stripe) Getting large quantities could be tougher. Perhaps sealing the bottom into a large drum, and having the top edge into the top of the drum would allow for a better quantity (and surface area) while still keeping the fish in the tubing. Cleaning the thing will likely be a horrid chore. Liberate the fish. Transparent hose /pipe between two or more tanks and see if they want to use it. If they do and it works it's more like a natural environment, as opposed to the dungeon concept we careless humans call 'keeping a pet'. Same can be done with captive birds and animals by linking cages. //edit// done. link from halfbakery: House of Fish, above.